How much sightseeing can you do in eight days? This has been a huge sightseeing week for us, and today was a perfect cap on the week. We spent last weekend in Hutchinson KS visiting the Cosmosphere and Kansas Underground Salt Mine. 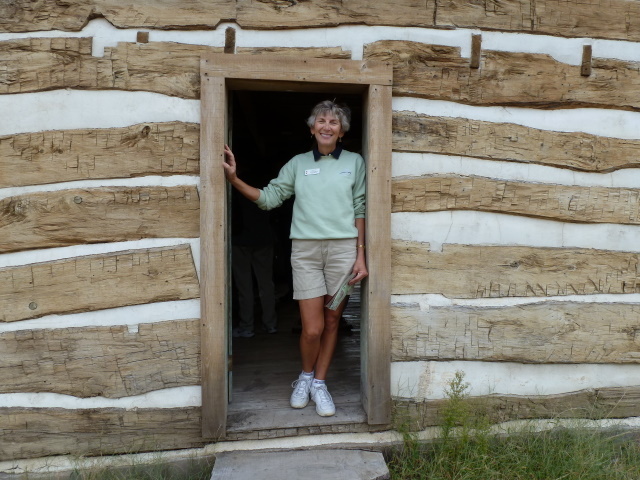 Dodge City was a nice overnight stop from Hutchinson because we arrived early enough to tour Boot Hill museum and the Santa Fe Trail covered wagon tracks nine miles west of Dodge City. An overnight stop in Tucumcari NM put us in an easy driving day of Albuquerque where we parked for four nights. Albuquerque needs more than four nights but we did the best we could and the weather cooperated wonderfully. Rode Sandia Crest tram and hiked to the Crest, ate at Duran’s Pharmacy (per Sterns’ Road Food book), toured Nuclear Science Museum, ate at Frontier restaurant (another Road Food pick), and toured the iHouse at Karsten Homes. Oh, and we shopped Camping World, of course. Although we couldn’t think of a thing we needed. Luckily we did come up with some good ideas while there and made good use of our President’s Club discount card. We won’t need to revisit CW for awhile. Today we drove from Albuquerque to Grants NM to tour the NM Mining Museum (great! ); then to Malpais Monument visitor’s center (where we received a wonderful tip about Ancient Way Cafe; visited the Volcano and Ice Cave; stopped in the Ancient Way Cafe for great pie and coffee place,; and visited El Morro (Signature Rock) before pulling in to St Johns AZ, finding an RV park, and connecting utilities 1/2 hour ago in the dark. We think the last time we arrived late for the night was a couple of years ago when we found ourselves being chased by a winter snowstorm coming up from the Gulf of Mexico. We were on our way between Mobile AL and Kannapolis NC and had plenty of time but if the storm hit while we were still west and south of Atlanta we might be delayed for a few very cold days. We drove through the night, arriving Kannapolis at 01:45 in the morning — and awoke to snow on the ground. Nothing nearly so dramatic today — just a full day of fun sightseeing. We’ll share pictures tomorrow after we arrive Mesa AZ. Dreamstreamrs going back to the salt mine? Why would a top notch aerospace science and history museum end up in Hutchinson KS, an hour northwest of Wichita? Apparently because the founder wanted it there. 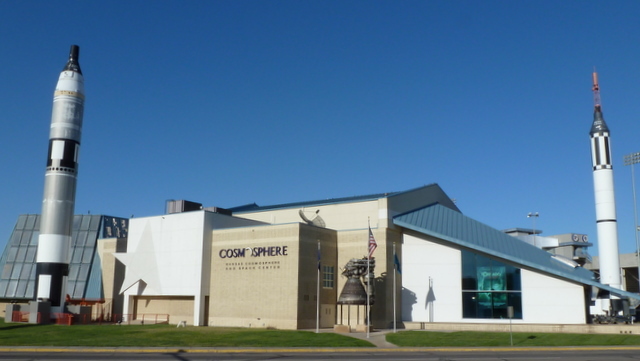 And the Kansas Cosmosphere and Space Center seems to enjoy Smithsonian Institute’s respect too, as one of only two museums entitled to restore used spacecraft. We had a little help from our friends. 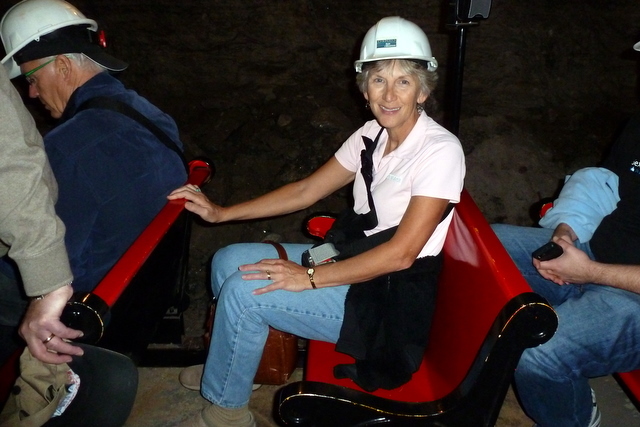 We wouldn’t have stumbled onto this or another of the town’s major attractions, the underground salt mine, without a direction from our Slater IA friends Janet and John, and our NOMADS friend Nedra. 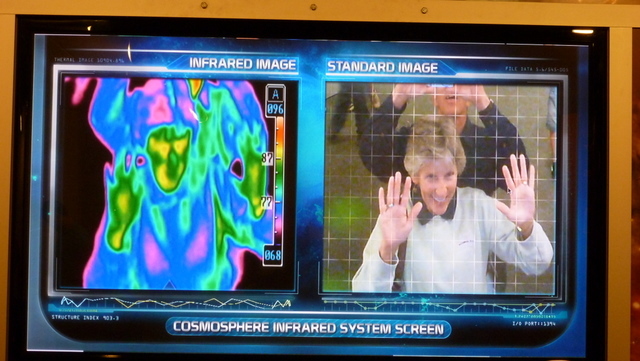 Janet and John, during our Slater visit two months ago, strongly recommended the Cosmosphere. Hey, they’re teachers and we figured they have to recommend these educational things. While working at Camp Horizon we learned from a Hutch local, Nedra, we should purchase the “double discount” ticket for both attractions. Our campground, Melody Acres, was on the prison side of town. 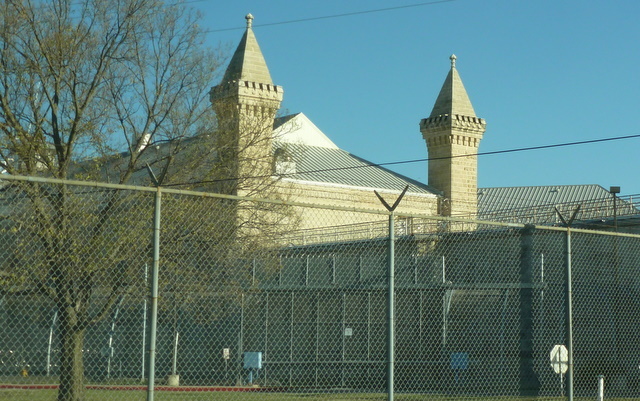 Each time we went anywhere we drove by one side or the other of a great huge Kansas prison.We later learned this is the Hutchinson Correctional Facility, a Kansas state prison, and was built from 1885 to 1895. The construction was pretty surprising until we learned the vintage — the twin towers and limestone walls formed from huge blocks are unusual-looking. Things were built differently back then, eh? Great leads on the Cosmosphere and Salt Mine, thanks to Janet, John, and Nedra. We had a great two-day visit to Hutchinson. Hutchinson sports a vital and attractive downtown, nice grocery stores, and is easy to navigate. We played tennis in strong winds at their really nice tennis facility near the fairgrounds. We spent all day Saturday at the Cosmosphere and still didn’t quite finish it. And we went way way down 650 feet below ground level to the salt mine. The Cosmosphere is almost too awesome to describe — better you should read about it at the wiki page here. 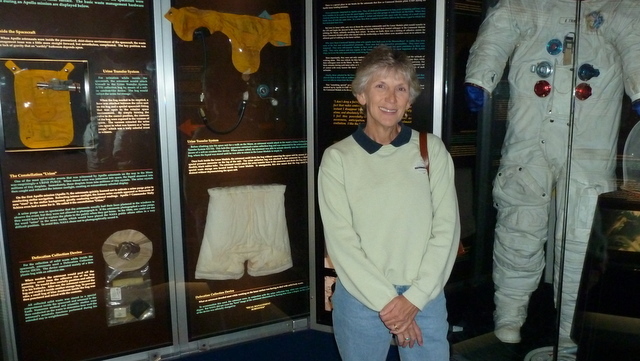 We were fascinated by the rockets and space travel history exhibits and surprised by the wide array and great detail in the exhibits ranging from V1 and V2 rockets to the Liberty Bell and Vostok capsules, lunar rovers and astronaut’s pee bags. Two of our favorite exhibits were the Apollo lunar missions and the German war missile history. And we enjoyed the lengthy treatment on the Cold War and the race to the moon. We liked the iMax presentation on tornados and would probably elect to skip the planetarium and Goddard physics lab unless we were with young children. The Cosmosphere has so many excellent exhibits we would, next time, spend more time browsing these. Maybe we could find our way through all of them. 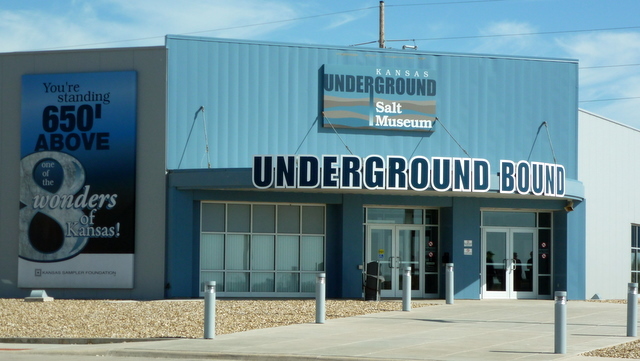 The Hutchinson underground salt mine is simpler for us to describe — really really deep and old. Carey discovered salt under Hutchinson in 1922, dug this incredibly deep (650 feet) well and started mining salt. In the ensuing years table salt, medical salts, road salt, and other types have all been mined from this same location. The Hutchinson salt mine is active and productive, and the only publicly open salt mine in the western hemisphere. We spent several hours way down there and found it intriguing and surprisingly comfortable. The ticket reservations folks warned us to dress warmly because the temperature would be 68 degrees. The humidity was 45 percent and the temperature was very comfortable without jackets. 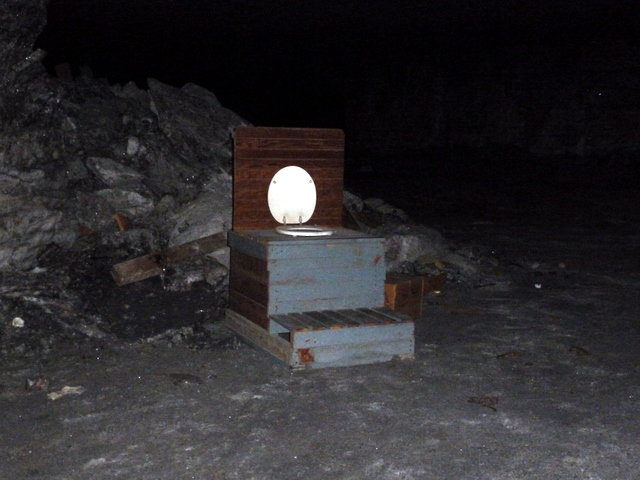 The scariest thing about the mine is how very dark it is without artificial lights. They have mined fifty feet wide bays between forty feet by forty feet columns of salt seven to eleven feet tall throughout almost four square miles. During the “dark train” ride throughout parts of the old mine areas (not the active mine face) our guide extinguished the cart’s headlight and we were in absolute and total darkness. 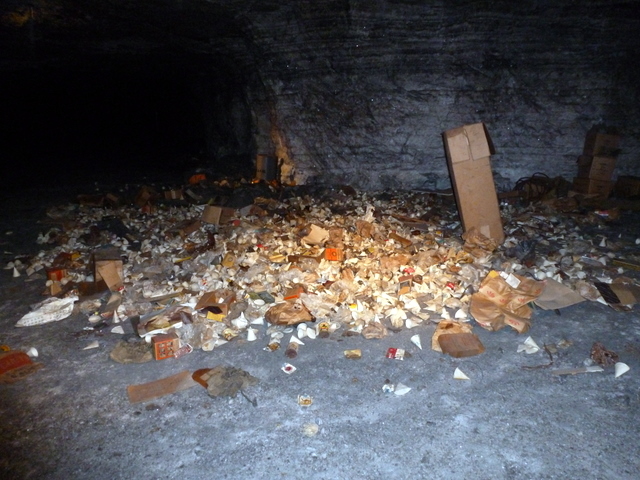 One of the lessons they taught us is about disposition of surplus and waste in a deep mine. Time is money, every trip up (and down) is expensive. There appears never to have been any waste brought back up from below, including old cars and paper cups and everything in between. I don't guess we can just dig another one? We just never gave it much thought, but do they really leave it all down there? The NOMADS Annual Meeting ended, we said our fare-thee-wells to friends old and new, and spent a last day leisurely enjoying Forest City IA. The 560 mile trip from Forest City to Ark City KS was more than we needed to make in one day so we hit the road early the next morning for a two-day drive. We made thirty whole miles before stopping in a very pretty downtown square in Clear Lake IA. Good friends Herb and Lois had told us about Cabin Coffee and we’d sampled and enjoyed the treat in Forest City. But hey, why not indulge ourselves again at what may be our last Cabin Coffee experience for many months? So Clear Lake was a great choice. Cabin Coffee is THE place to be Saturday mornings in Clear Lake — we had a fifteen minute opportunity to watch a lot of people coming and going, catching up and enjoying, before we earned our spot at the order window. And yes, the coffee is definitely worth the wait, even “to go”. Properly fueled, we headed down I-35 for the next bathroom break, and the next one, and another or three before we were south of Kansas City KS to our Cracker Barrel overnight stop in Olathe KS. You know, we’ve always wanted to pay our respects, meet the help, and check out the good cooking when we stay overnight behind or beside a Cracker Barrel. And this one in Olathe did not disappoint. We enjoyed great eating and very quiet overnighting in the amply-sized RV and big rig parking behind this Cracker Barrel. Did you know their store directory has an asterisk beside every location with RV-friendly parking? We pulled through Ark City to find Camp Horizon early Sunday afternoon. Wow, this was a great place for us and the other eleven NOMADS volunteers. 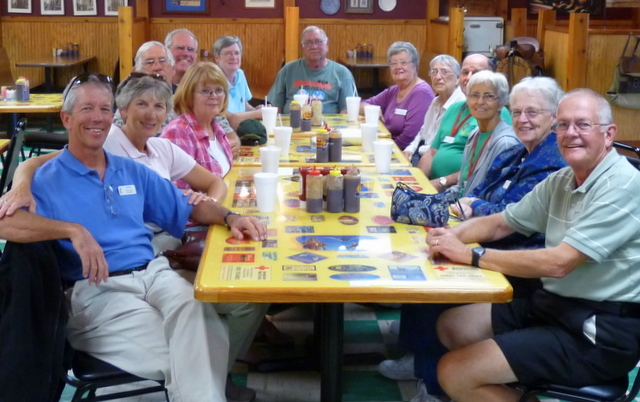 Twelve of our group of thirteen volunteers in mission were in RVs, and one stayed in one of the camp’s cottages. Our camping space had full-hookups, partial shade, was close to our work areas and was just wonderful. Camp Horizon started in the mid- to late-1940s and is a wonderful complete camp and conference center on 160 acres. The camp buildings and outdoor chapel areas sit atop a 3/4 mile long ridge with fabulous views to the south and west horizons. The skies were clear most of the time and we could see forever in both directions. The hilltop position, one to two hundred feet above the surrounding farms and lowlands, helped a lot with Jim’s ham radio work (play!) to. He worked a station in Sao Paulo Brazil on 10 meters FM and one in Saitama City Japan on 12 meters sideband, his first contacts ever on either of these two bands. Too, Jim was able almost daily to talk with ham radio friends back east and in the Rockies. Mid-continent is pretty good for U.S. ham radio operations and atop a nice hill with an antenna strung high (40′) between two trees it just gets better. We weren’t at Camp Horizon to play on the radio, though. Our hosts at Camp Horizon had a page and a half of projects and tasks they asked our group to tackle. 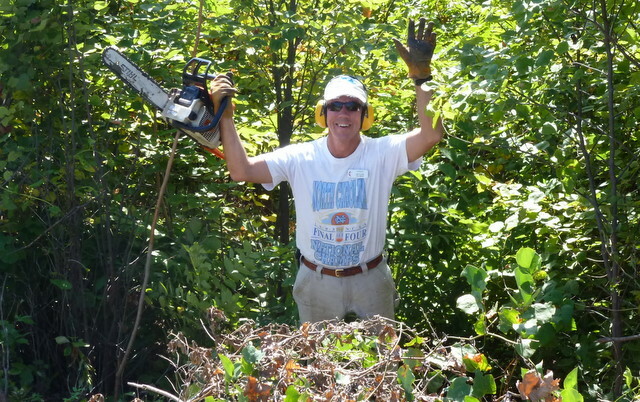 Jim and his work buddy, Cliff, spent all twelve work days (three four-day work weeks) clearing brush, felling small trees, and other outdoor work. Jim kept telling everyone this was his physical training for tennis season which starts early November. Whatever gets you through the day, Jim! 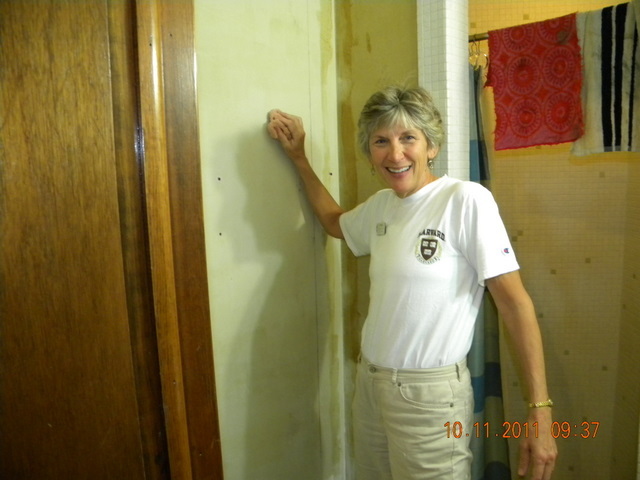 Debbie spent all twelve days working indoors wallpaper removal, patching, painting, organizing vast files, organizing storage areas, and carpet shampooing. Some of the work was grungy but it was all rewarding for Debbie. She could see the results of her work AND the hosts were tremendously appreciative. Three weeks was a nice time-frame to learn an area. We visited two churches, played tennis a couple of times in the city park, visited the ice cream parlor, shopped consignment shops for more work clothes, and toured Cow Town in Wichita and the Marland Mansion in Ponca City OK.
Marland Mansion was pretty amazing and a lot sad. E.W. 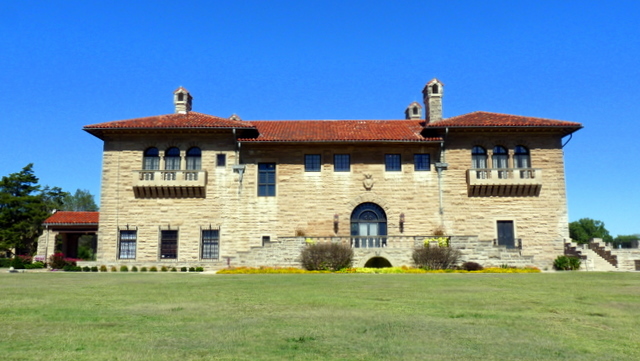 Marland struck oil and made a fortune early in the twentieth century. He spent a tremendous amount of money in his business, was generous with his employees, and built an extremely extravagant fifty-five room mansion. His business decisions and the markets required him to seek financial aid and, unfortunately for E.W., he asked and received “help” from some N.Y. banker named Morgan. J.P. Morgan and Co took over ownership and management of Marland Oil, merged it with Continental Oil and renamed it Conoco, and left an angry former owner by the wayside. Marland and his wife lived in the new mansion less than two years, and thirteen years after completing it sold it for a fraction of the construction cost. He lost his fortune but left a gorgeous house which has been wonderfully restored and is open for tours. We had a three-hour tour of the house and grounds and enjoyed it tremendously. Cow Town in Wichita KS represents the other end of the social spectrum and perhaps seventy-five years earlier in the western states’ history. Cow Town is an outdoor walking museum containing 1800s homes and businesses moved from in and around Wichita. We walked through four homes, almost a dozen businesses from the butcher to millinery, grain elevator to drugstore. Cow Town provided us an interesting history lesson laced with great home-made cookies, ice cream, a bratwurst lunch, and a variety of entertainment. Three four-day work weeks provided the thirteen NOMADS a great opportunity to complete the host site task list. We started every day with devotions and singing, we had fun in games and sightseeing and break times, and we enjoyed getting to know one another and the camp staff. And we worked hard on our projects list. Our project leaders very capably and calmly guided us (and the hosts) through the list so everyone could work on what they wanted to, we exceeded the hosts’ expectations, and all felt the project was very successful. Our mission project ended Thursday afternoon. No vinegar-pepper sauce for BBQ is no laughing matter! Friday morning we packed up and headed in all directions. Some headed south for Oklahoma or Texas. A couple returned to Indiana. Three are from Kansas and had short trips. We headed northwest toward Hutchinson KS. And that’s a story for another day.